The Benevo Original Complete Adult dog food is a wheat free, vegan dog food which is ideal for those dogs which suffer from wheat sensitivities. It contains naturally rich ingredients with brewer's yeast to provide your dog with a highly palatable meal every time. There is a 27% protein content and no artificial flavours or colourings. It meets all the nutritional requirements for a healthy adult dog and has an added probiotic FOS to give support for a healthy digestive system. Soya, Corn, White Rice, Sunflower Oil, Peas, Brewers Yeast, Sugar Beet Pulp, Tomato Pomace, Yeast Based Palatant, Minerals, Vitamins, Yucca Schidigera Extract (0.1%), Fructo-Oligosaccharides (Prebiotic FOS) (0.01%). Vitamin A (as retinyl acetate) 17,000 IU, Vitamin D2 (as ergocalciferol) 2,314 IU, Iron (as Ferrous Sulphate Monohydrate) 154.3 mg, Zinc (as Zinc Sulphate Monohydrate) 128.6 mg, Manganese (as Manganous Sulphate Monohydrate) 101.3 mg, Copper (as Cupric Sulphate Pentahydrate) 55.6 mg, Selenium (as Sodium Selenite) 0.6 mg, Iodine (as Calcium Iodate Anhydrous) 1.5 mg, Linoleic Acid (Omega 6) 6.46%, Linolenic Acid (Omega 3) 0.09%. This is a guide only, amounts can be varied depending on age, activity levels, the season and appetite (split these into 2-3 servings through the day). 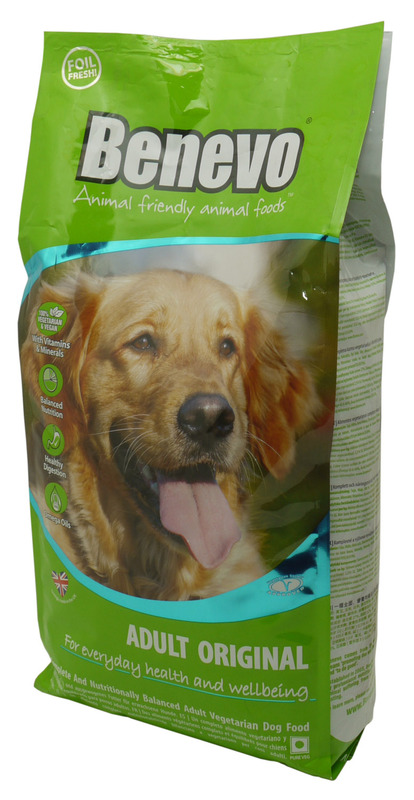 There are currently no questions for Benevo Original Complete Adult Dog Food - be the first to ask one!